The idea of health – human health – runs like a thread through permaculture design, at once implicit and fundamental: in the linking of food production with ecosystem health; in the holistic, measured approach towards observing changes in other living things; in the need for compassion that underpins the core permaculture ethics of “people care” and “fair share”. But as a student of permaculture I hadn’t yet bored down into the metaphorical substrate of my own “Zone 0” to think about health at an individual level. At least, I hadn’t much done so using the new analytical lenses afforded me in the permaculture program this year. But one of the unique things about Pacific Rim College is the access one has to various different modalities under a single educational umbrella: I’ve attended student clinics and participated in discussions that touch on aspects of acupuncture and Oriental medicine, holistic nutrition, and Western herbal medicine over these past months, but save for our Herbal Production and Processing class, never in a classroom setting. And so it was with eagerness that I attended a workshop at the college this weekend entitled “Introduction to Somatic Herbalism” with Sean Donahue. 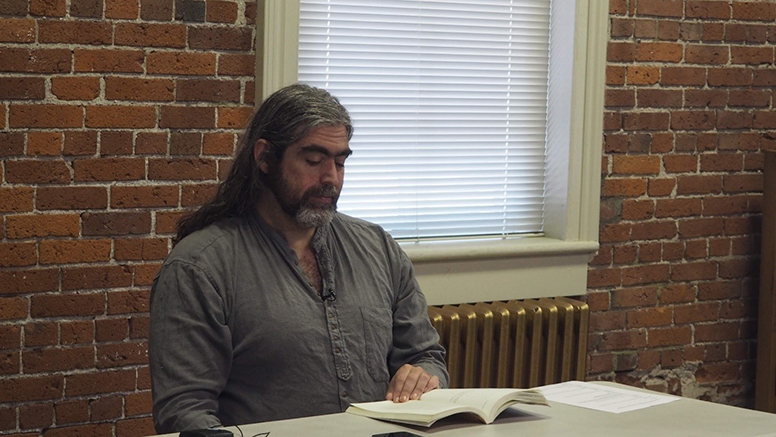 Herbalist Sean Donahue reads before the start of his workshop Introduction to Somatic Herbalism, delivered at Pacific Rim College. Sean is a member of the faculty at Pacific Rim, though he now lives in the State of Washington and was returning for the event as a guest lecturer. He’s a herbalist and a priest in the BlackHeart line of Feri witchcraft, and while a fuller accounting of his exploits and accomplishments can be found in his bio, I can report with confidence after this weekend that he is also a riveting and indefatigable speaker. The word “herbalist” doesn’t appear in recorded English until the seventeenth century – before that time, as most people used plants routinely as medicine, it wasn’t considered a concept remarkable enough to warrant the designation. But together with the emergence of the word came the tangling up of its practice with the jealous gatekeeping and political pretensions of the day. An example: early English herbalist Nicholas Culpeper angered physician guilds of the mid-seventeenth century by translating medical guides from the Latin in order to make information and treatments more accessible to the poor; he was ultimately imprisoned for his trouble. The word “somatic” is derived from the Greek sōmatikós, meaning “relating to the body”. Its early Christian use was mostly derogatory: the Gnostics, who believed that our physical world was the invention of a false god, sought the divine directly through ecstatic experience and eschewed any attachment to the physical realm. To be a “somatic”, then, was to be doubly heretical, condemned both by the Gnostics and by church authorities. 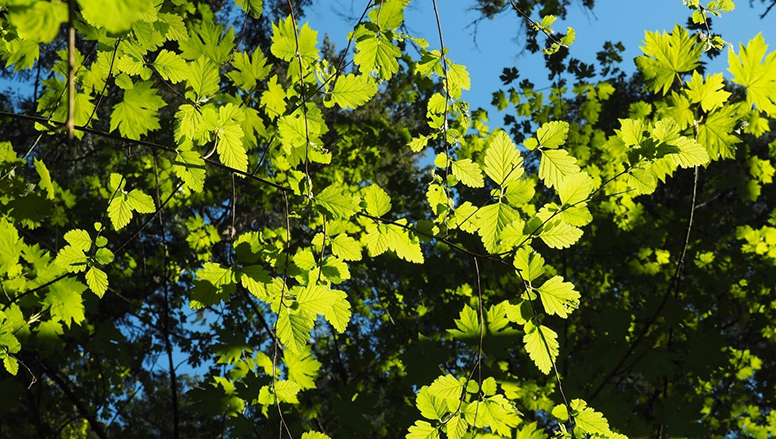 Sunlight dancing on the leaves at Hatley Park National Historic Site, Colwood. Sean suggested that the idea is similarly stigmatized today, albeit through slightly different mechanisms that reflect attendant cultural shifts over time. First with the advent of enclosure laws, and now the private property regimes of contemporary capitalism, people are increasingly separated from the land and from those living things that surround them. Residue of this puritanism exists even in strains of New Age and Ayurvedic thought that deny the centrality of the body and of bodily pleasures. At the core of Sean’s somatic herbalism is a conviction that this disconnection is profoundly traumatic – and that human consciousness, through which trauma is mediated, is more varied and more widely distributed than we tend to acknowledge. Sean argued that if one is exposed to prolonged trauma or violence without a sense of support, it causes physical changes in the body. Disconnectedness and a cultural imperative towards individualism mean that one will have less innate sense to react to perceived danger by seeking cooperative solutions or help through collective action. (L-R): Driftwood on Muir Creek Beach, near Shirley, B.C. 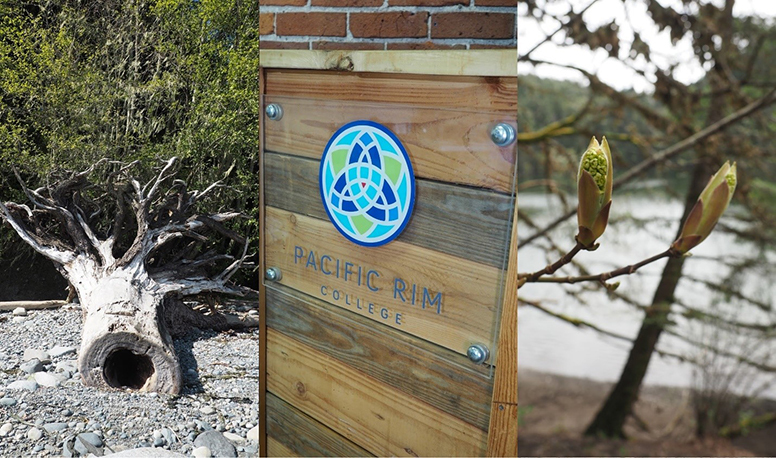 ; a podium at the Pacific Rim College downtown campus; maple blossoms at SṈIDȻEȽ (‘Place of the Blue Grouse’, also called Tod Inlet). High stress levels and a lack of embodiment mean that many people alternate between hypo- and hypersensitivity, with the particular psychoactive effects of cortisol giving rise to a kind of detached pessimism. For Sean, the past lives on in our bodies – because continuous trauma spurs changes in the human genome, we are all carrying memories of trauma across generations as a kind of oft-ignored inheritance. Similarly, the theory of psychoneuroendocrinology, which holds that our hormones instruct our immune response about a perceived level of threat, suggests that if one is not sufficiently well-embodied, one can misidentify the situation they’re in and won’t produce the appropriate hormones. In turn, this underlies many chronic health conditions present today. The good news, as Sean put it, is that we can change our genomes again, to move forward and pass down something different. Medical orthodoxy, which today in some ways is guilty of Federici’s charge of assuming the body to be a machine, is not always adequate in its response here. Sean’s preference is to work at sub-pharmacological doses of herbs, in an invitation to the body to tap into its somatic memory and sustain an authentic embodied connection – what Sean called “the touch of the world upon our own heart”. 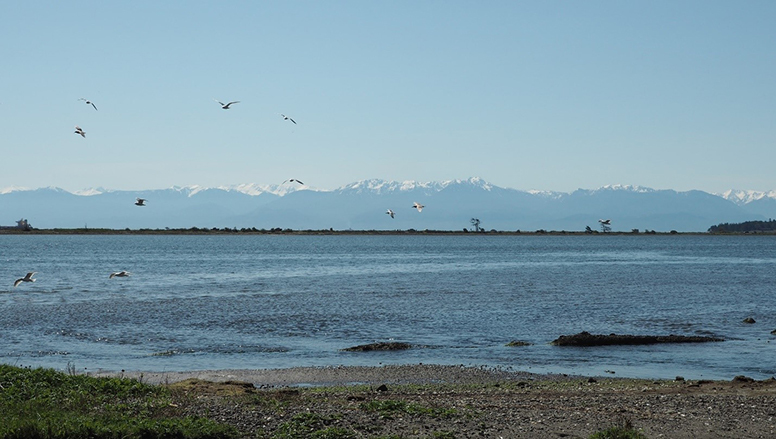 The Olympic mountains across the Strait of Juan de Fuca in the State of Washington, with the Esquimalt Lagoon Migratory Bird Sanctuary visible in the foreground. For those who have experienced significant relational trauma, the body may associate other people generally with danger. In this case, plants – with whom we are engaged in a sort of constant conversation, trading our inhalations with their exhalations – can be asked to provide this connection. Sean’s therapy, then, is a gentle one, centered on small interventions to bring a feeling of safety, and trusting in the body’s capacity to reorganize itself. I was conscious of many parallels between Sean’s perspective, together with the practical clinical approach he discussed with the class, and permaculture concepts we’ve studied this year. Most prominent, I think, was the core centrality of holistic connection (a concept Mark Lakeman discussed at length in a permaculture context earlier this year). Also valuable was the discussion of how the body copes with trauma (through physical tension, for instance), which bore similarities to the behaviour of irritating plants we’ve studied – poison ivy, poison oak, devil’s club – that grow in disturbed and damaged places and set a kind of boundary, effectively telling people, “don’t set foot here”. Beyond this was the sense that healing and health are fundamentally ecological in nature. When we, as humans, are in ecological balance, we can better connect with and promote external ecological balance. This suggests, I think, the need to integrate with the diversity around us, rather than trying to mechanistically segregate ourselves as if we are wholly independent beings. If, as Sean urged, we work to engage this embodied experience, will move organically towards a connection with all living things.